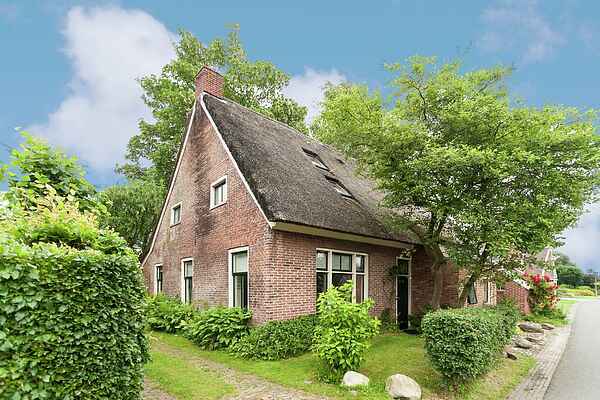 Farmhouse with thatched roof and authentic elements; a tasteful accommodation in the unspoiled village of Eext. The farmhouse has been renovated and the 17th-century cross-beams have made visible again. Thanks to a strip of glass in the roof, the light can reach the heart of the farmhouse, all the way to the new, special hallway and bathrooms. All of the walls are plastered with clay in warm earth colours. On the ground floor, the house features a living room, where you'll find cabinets with nice parlour games, a basic, fully equipped open plan kitchen, a bedroom and a separate toilet. The second bedroom with bed box and single bed can also be found on the ground floor and is a very special part of the holiday, especially for the children. On the first floor you'll find the second spacious bedroom and separate room with foosball game and table tennis table. The surroundings of Eext are very suitable for hiking and cycling enthusiasts. Within 10 kilometres you'll find many old maple trees, heaths and forests. The city of Groningen with its many museums, galleries and nice shops can easily be reached by car.